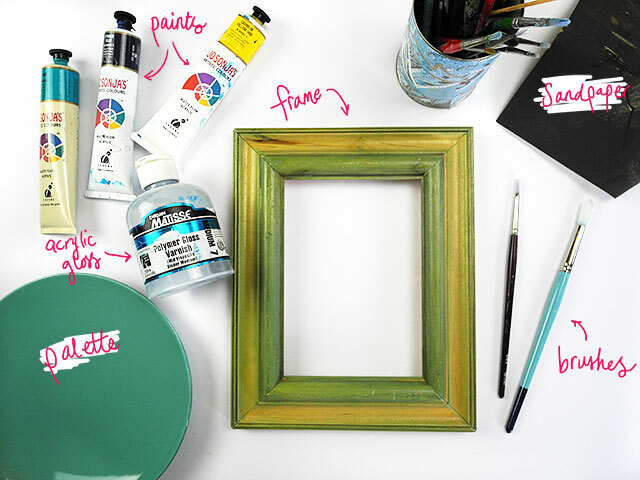 A frame painting craft tutorial for you today. 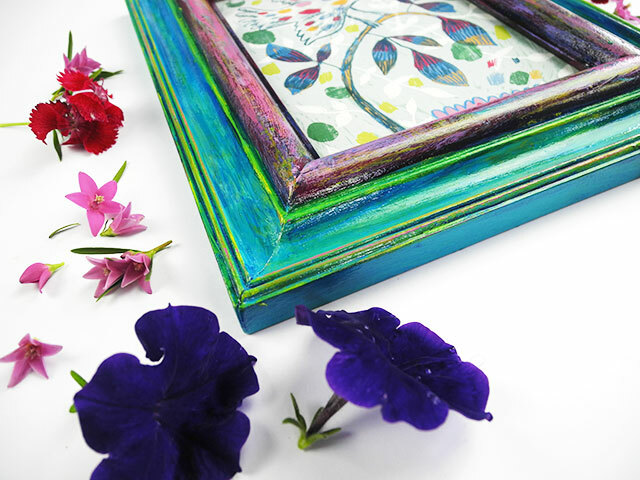 The end result is a textured frame that looks like it has some history... It has the look of having being painted a few times, but that is due to the texture that we will achieve through using paints and an acrylic gloss medium. This post contains affiliate links (see bottom of post for explanation). First, gather your supplies. 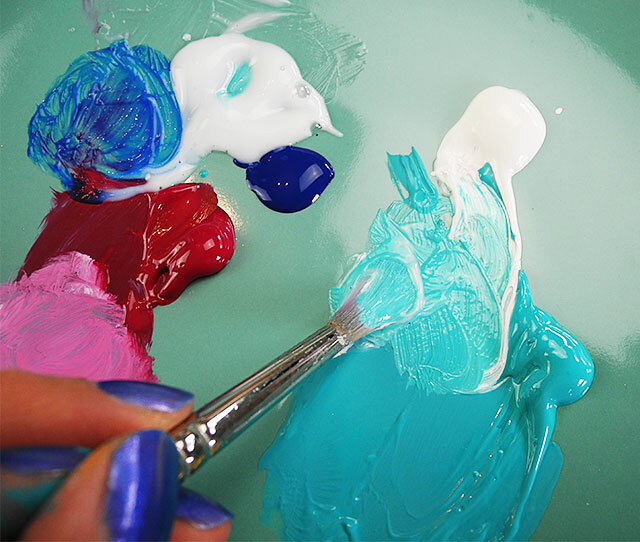 Acrylic paints (Jo Sonja's acrylic paints are my pick), an acrylic gloss medium or varnish (Matisse Polymer Gloss Varnish is my fave), some fine sandpaper, and of course a frame and brushes and paint palette. Tissues will also come in handy. 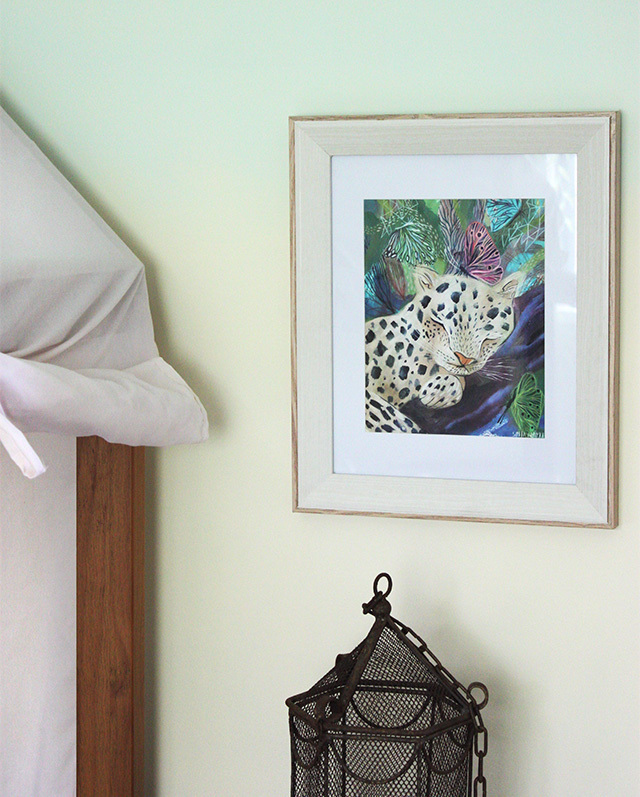 When choosing a frame to paint, you want to grab something that has some different levels and surfaces. Some texture like flourishes or flowers would be even more interesting! I got this one from an op shop. 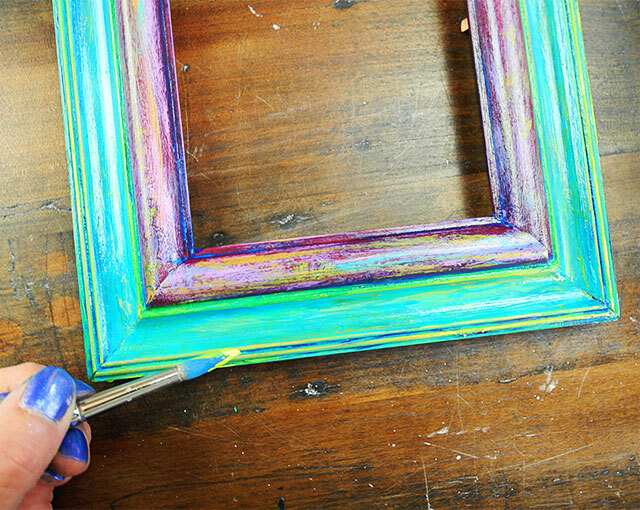 There are no hard and fast rules when it comes to painting your frame. Choose whatever colours you like. 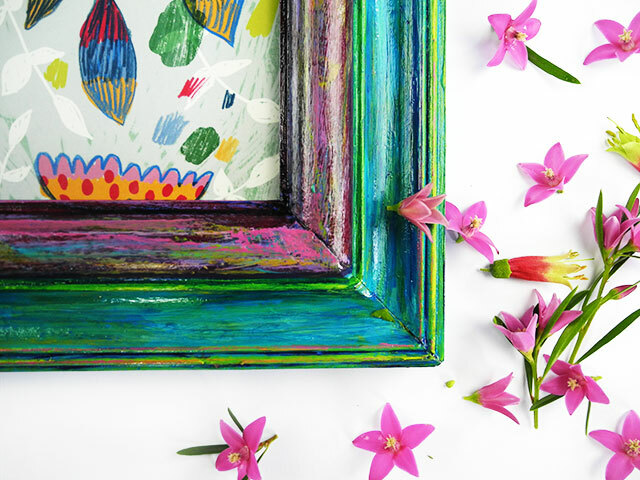 You could find an image with colours you love and try to replicate them into your frame. After removing the backing and glass and giving my frame a light sand, I chose to coat my frame in two colour to start with. Turquoise, and a deep pink. I then coated the frame with the acrylic gloss. Once that was dry I mixed up some lighter pink and brushed a bit off onto some paper to 'dry' off my brush a bit, and then dry-brushed it onto the deep pink colour. I highlighted some of the thinner details of the frame with some bright green. Then I mixed some pthalo blue with some of the varnish and brushed it over the turquoise. Use a damp (just damp- not wet) tissue to rub parts of this paint mix off before it has dried, leaving some areas darker than others. I then added some orange paint by painting it onto a scrap piece of paper and rubbing it over the frame. I also did the same with some bright pink which you can see in the end photos. Next up, I mixed up a lighter turquoise paint with some gloss varnish and scrumbled and painted that in random places all over the frame. I decided I would like to bring out more of the green layer so added some more highlights in using some yellow paint. 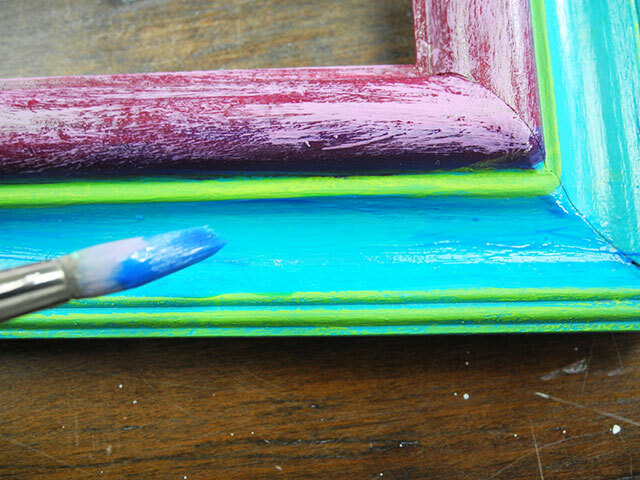 I also used the pthalo blue mixed with some gloss to go over the pink part of the frame, using my tissue to wipe parts of the paint back, leaving darker areas especially in the recessed areas of the frame. 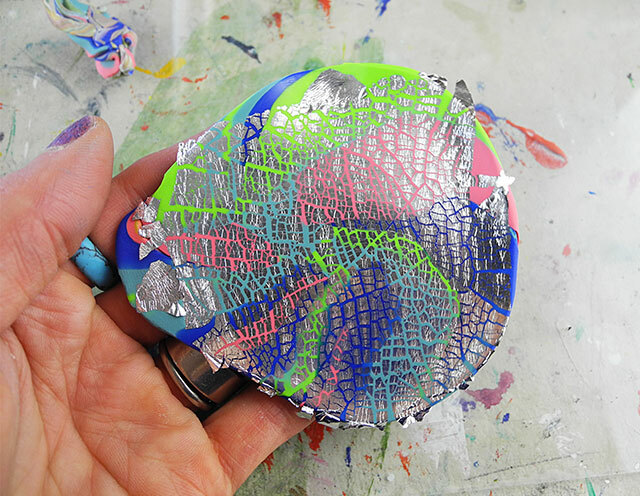 You could go nuts by adding more colour by dry-brushing, or adding more coloured gloss mixes, or scrambling more paint over it using the scrap paper. 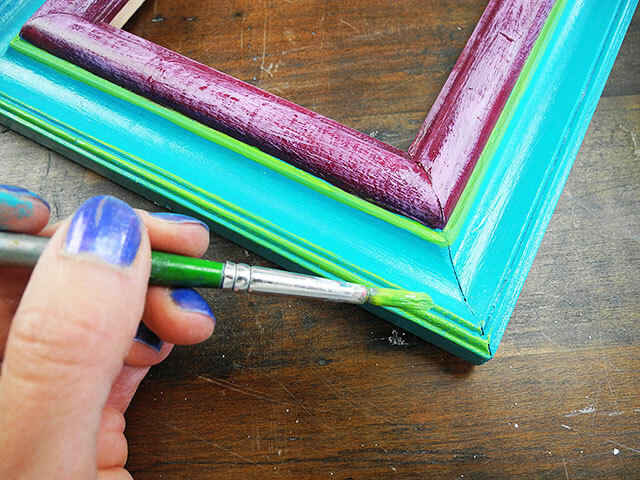 Once you're happy with the look of your frame, give the whole thing one final coat of gloss varnish. So you can see how layering up the paint and gloss quickly adds texture & and the look of lots of layers. 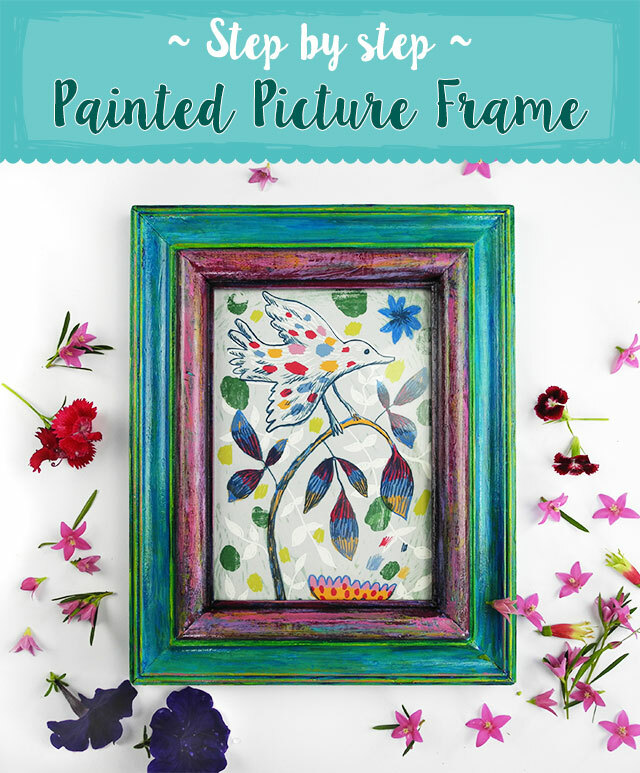 You can really play around with the techniques described to come up with your own unique frame in your choice of colours. 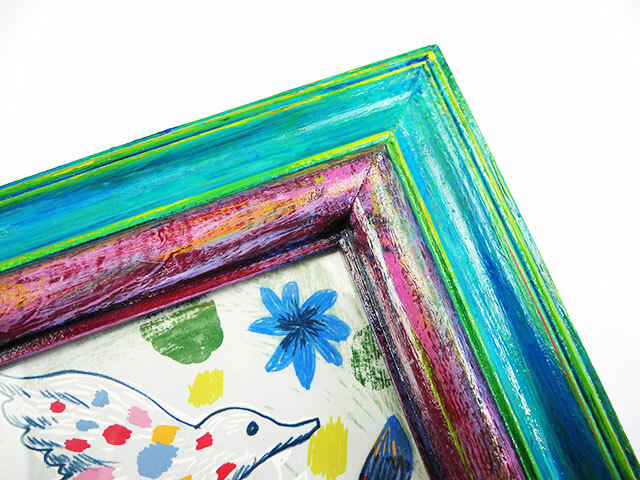 Let the frame dictate to you by it's unique shape how it needs to be painted, and most of all, have fun! *Affiliate Information: Affiliate links help me earn small commissions on products (at no extra cost to you), which helps support my love of blogging and sharing creative things. I only ever recommend or link to products that I'm genuinely into or would use. 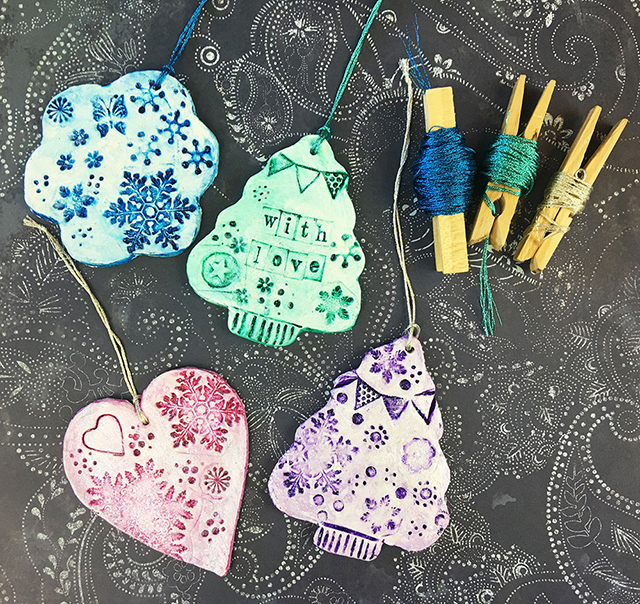 Last Minute DIY Christmas Craft! 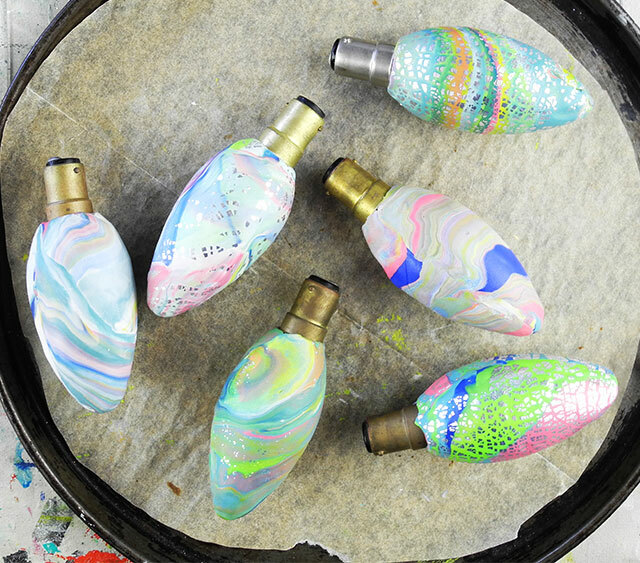 Can I squeeze in another DIY Christmas craft!? 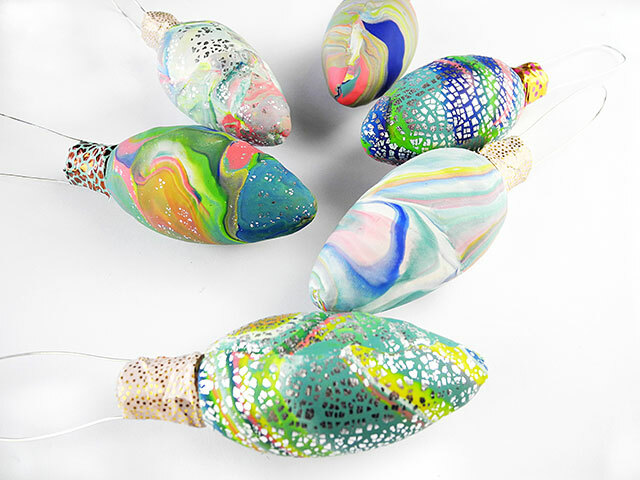 These ornaments are made from air dry clay using stamps, acrylic paint, acrylic gloss, fine glitter, and shimmery thread. 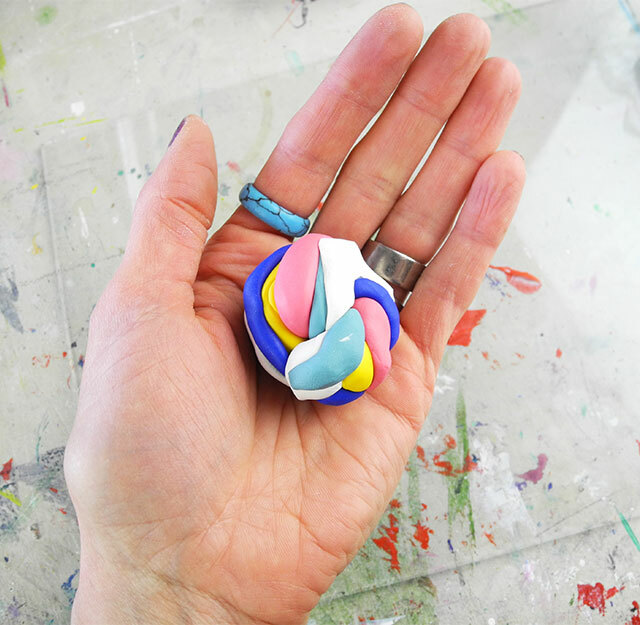 Air dry clay is the next best thing to using actual real clay; but much more accessible and there are some really good ones out there on the market now, so play around with different brands to find the one you like best because they all have different qualities. They are getting the mixes of these air dry clays better and better, and some of them feel as though you are using real clay. 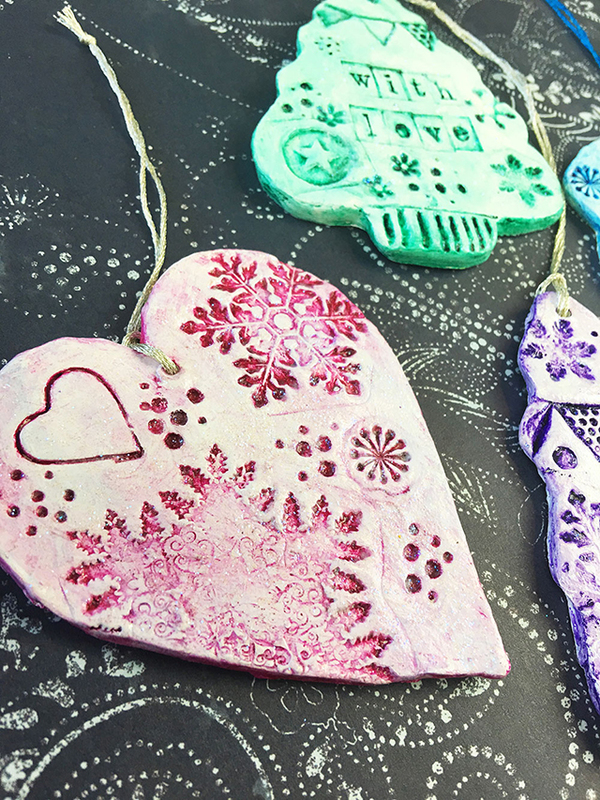 I rolled out the clay first then cut out shapes using Christmas cookie cutters as my guide. I traced around them as I wanted them bigger than the cutters I had, but you could also just use the cutters to cut the shapes if the are the size you want. 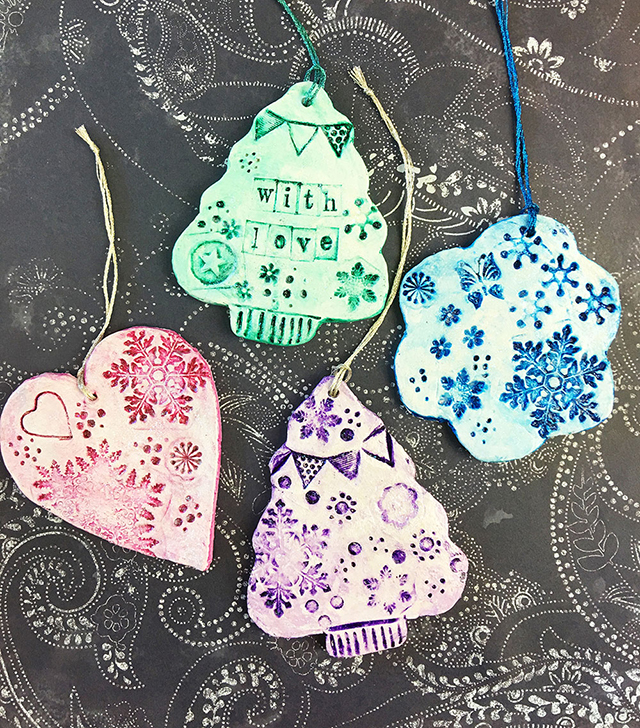 I used Christmas-themed stamps and various high-tech-tools like a knitting needle and wooden skewer to make impressions into the clay, then I left them to dry. 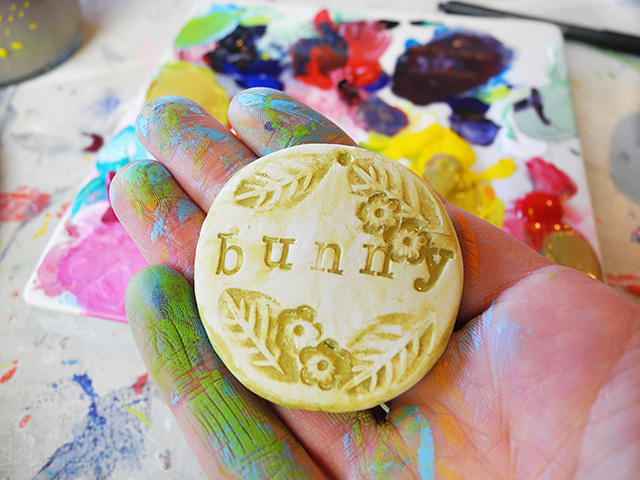 Once dry, I coated them with gesso and dried that using a hair dryer. Then a coat of acrylic gloss. You want something shiny that will enable paint to wipe away from later. Dry the gloss. 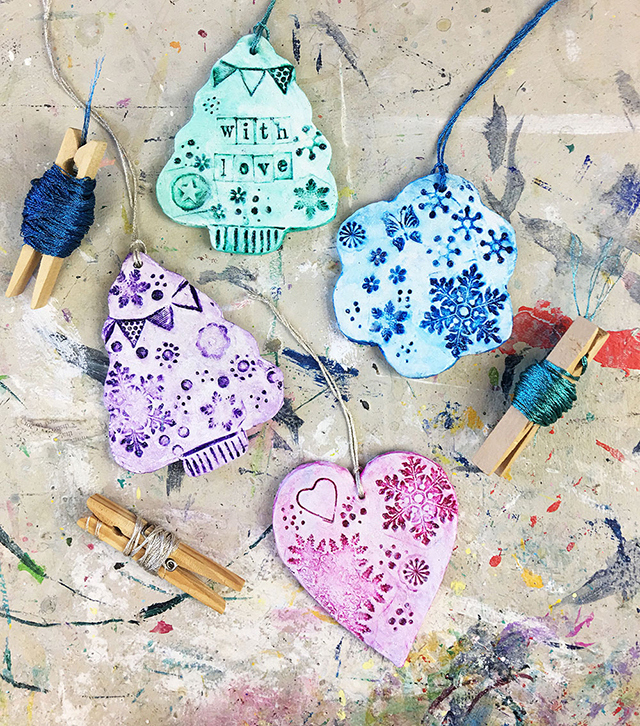 Then use some acrylic paint in you choice of colour and paint all over, getting in all the indents of the decorative elements. Wipe back with a damp rag to reveal the texture and bring out contrast. Then once the acrylic paint was dry, I painted a final coat of gloss and sprinkled some fine glitter into the gloss while it was still wet. Add some pretty thread to the top for a hanger, and you're done! 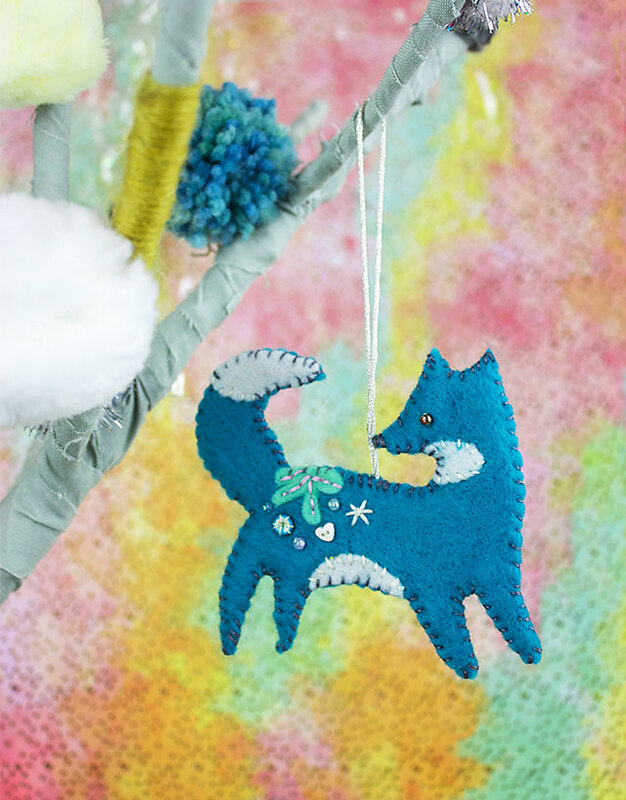 And if you're feeling extra crafty, I also recently made this fox Christmas decoration craft into a tutorial for Alisa Burke. 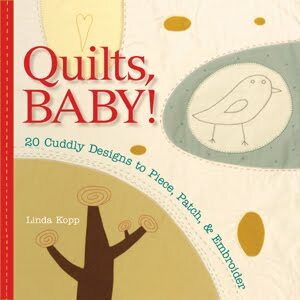 You can find that tutorial here. Really, I want Christmas to go for a bit longer this year, as I haven't made all the decorations I wanted to! Lucky (!?) the years go fast so next Christmas will be here before I know it! I hope you enjoyed my last minute DIY Christmas craft! 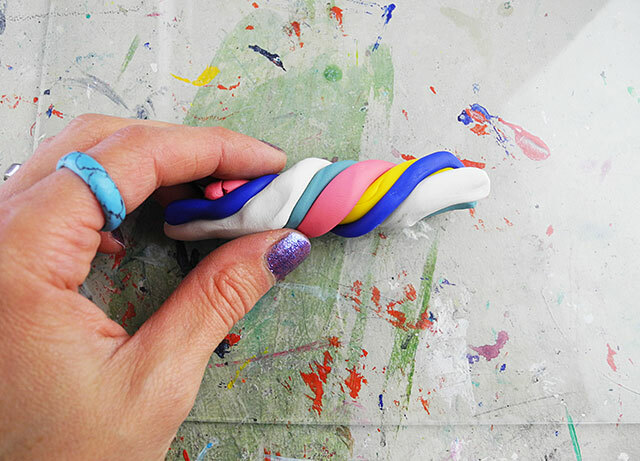 Then roll your clay into a log once more, then twist and roll into a ball. Do this a few times (I like to do this around 3 times) and your clay will start to marble. Experiment to see what you like. The more you mix, the more marbled your clay will be. 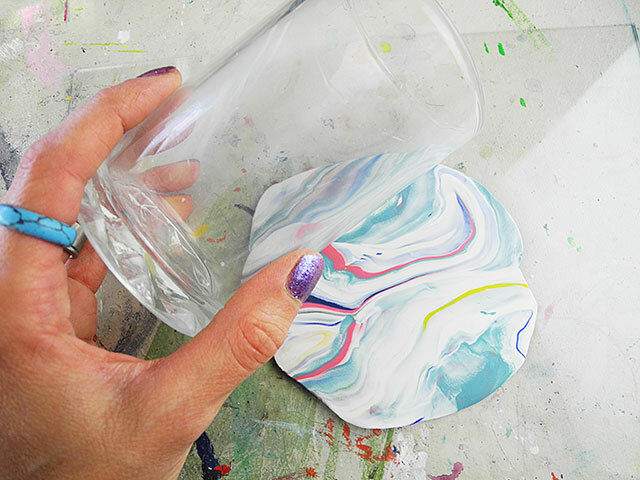 Over mix and your colours will all blend and mix together and you will lose the marbled effect. You will see the marbled effect the clay has once you start rolling it out. Take your rolling tool, like my high-tech even-sided glass shown here, and start to roll out your clay. 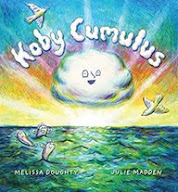 This is where you get to see the magic of your marbled polymer clay! Roll it out quite thin, about 1-2mm. It's opaque so you don't need to worry about seeing through the clay, you just want to make sure it's not so thin that holes start to tear into it. 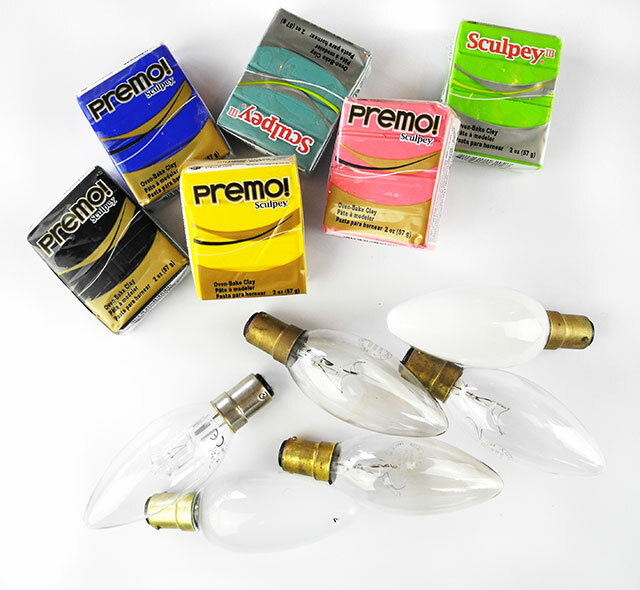 Take one of the lightbulbs and wrap the clay around it, manipulating it and smoothing and pressing as you go. 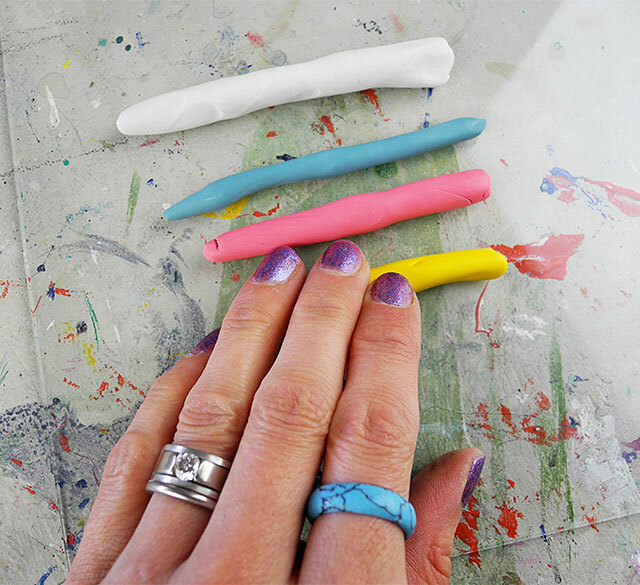 Trim the excess clay and use your fingers smooth and disguise joins. 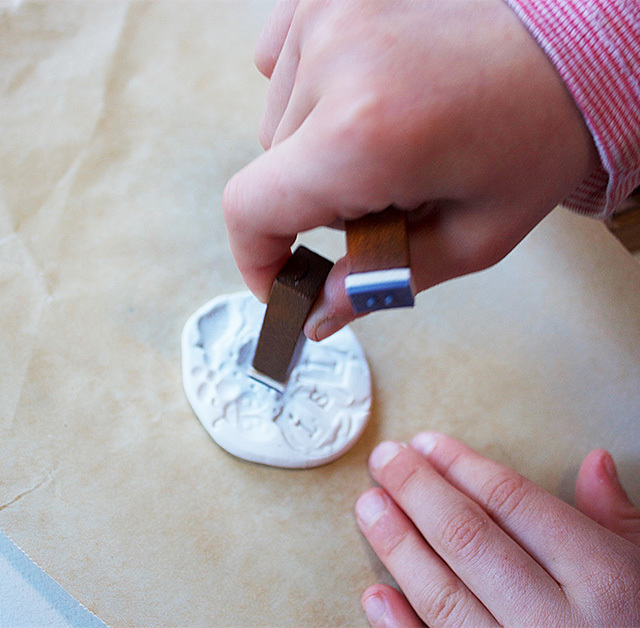 If you'd like to use the silver effect, press your clay onto a sheet of the silver leaf, gently sticking the leaf to the clay. Do this once you've first flattened the clay a little, then continue rolling the clay and the silver leaf will start to crack and give that distinct look you see below. Keep rolling until it's thin again. 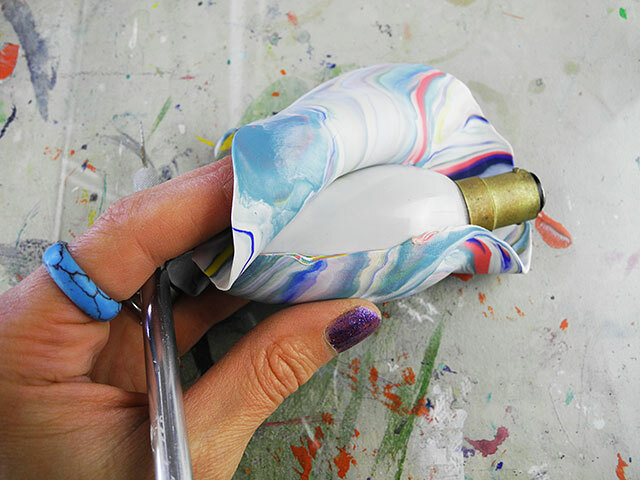 Wrap around another lightbulb then trim and smooth as above. Once all smooth and done, bake the lightbulbs in the oven according to the instructions on the pack. Now to make the hanger. 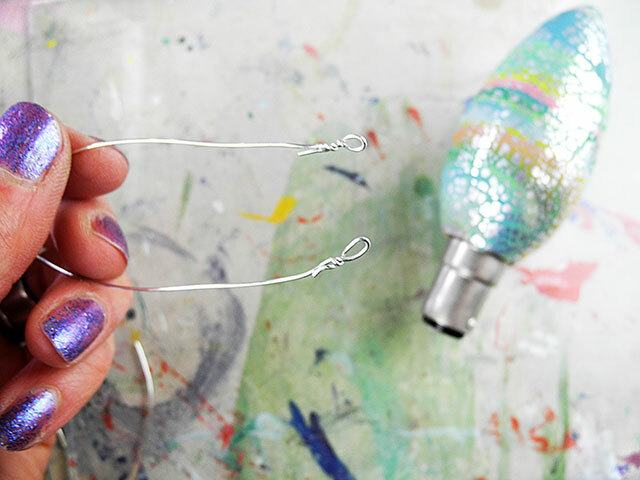 Take a length of wire and make two small loops in the ends using two pairs of pliers helps here. Thread another length of wire through these loops and use that piece to wrap around the base of the lightbulb end. 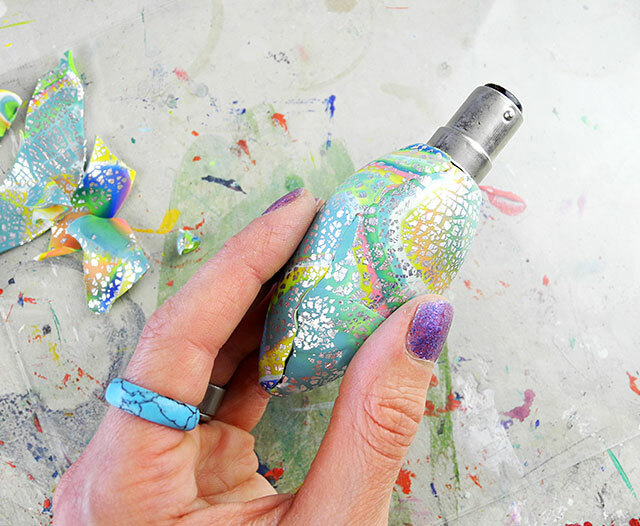 You then take some pretty washi tape and wrap it around the unsightly lightbulb end to make it pretty! It also doubles up it's purpose by holding the wire in place. I'm pretty pleased with the outcome of this Christmas craft! 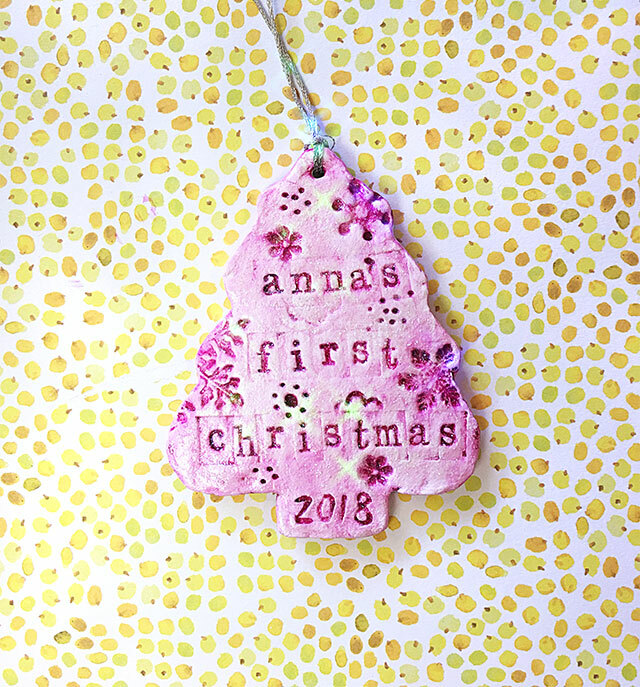 You can make them in your own individual colours, and they would make great handmade gifts for the festive season too. 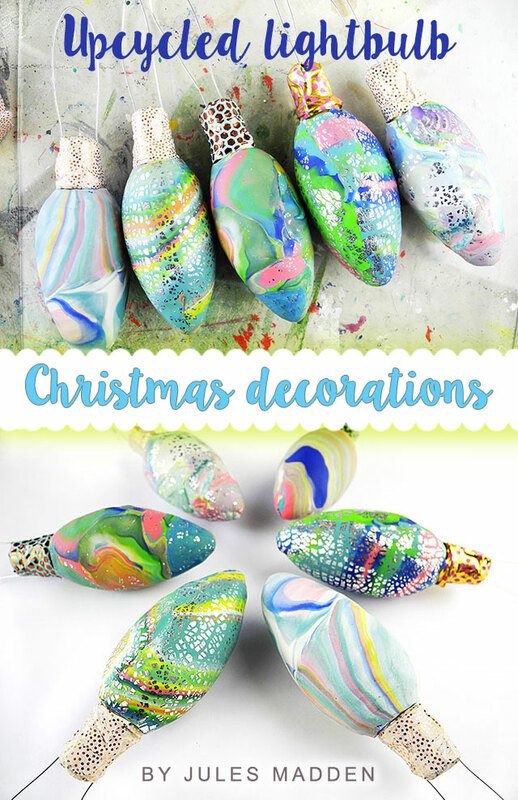 So, if you find yourself with some spare time that you just don't know what to do with, and you have a collection of old lightbulbs like I do, then give making these Christmas decorations a go! 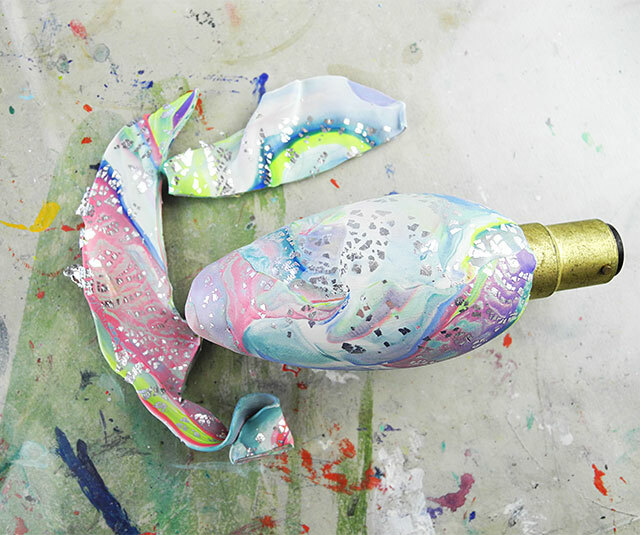 I hope you enjoyed my my DIY Christmas decorations tutorial! *Affiliate Information: Affiliate links help me earn small commissions on products (at no extra cost to you), which helps support my love of blogging and sharing creative things. I only ever recommend or link to products that I'm genuinely into. 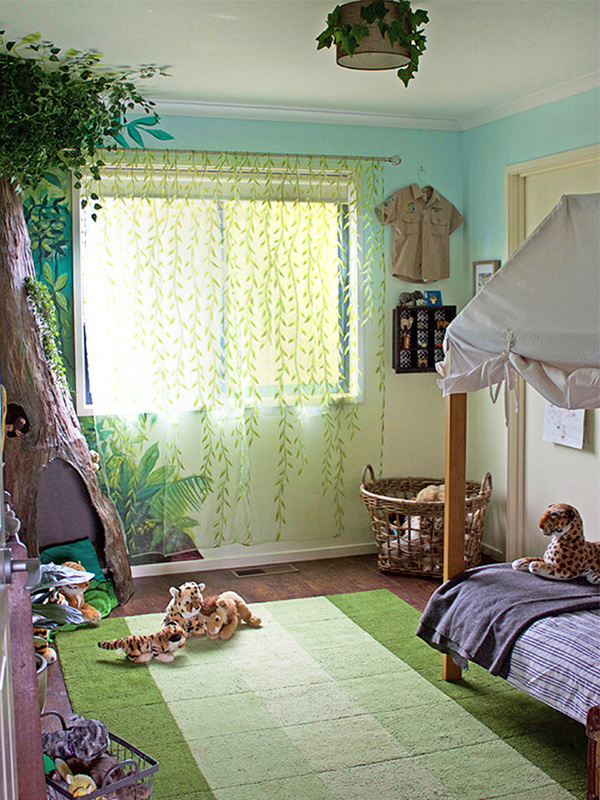 Home Decorating For Kids: My Daughter's Jungle Room Makeover! 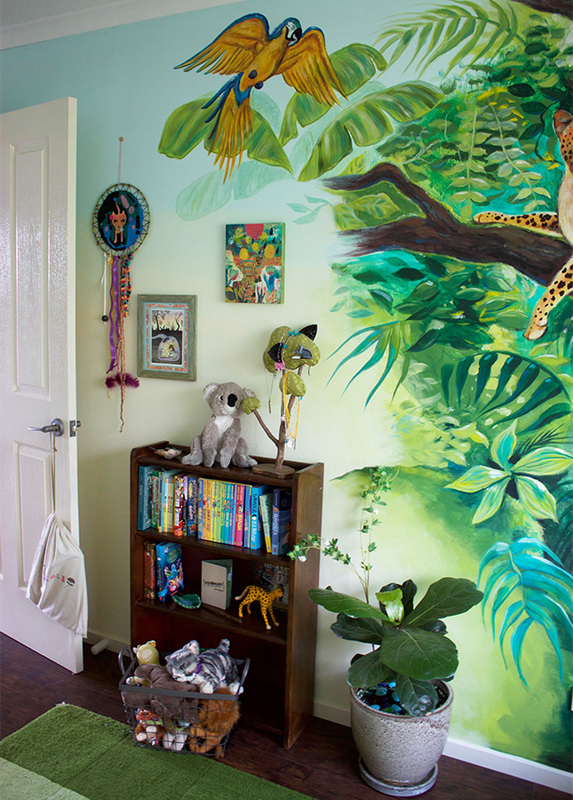 I'm sharing with you my latest creative home decorating project, my youngest daughter's new African jungle safari themed bedroom, complete with a new mural! 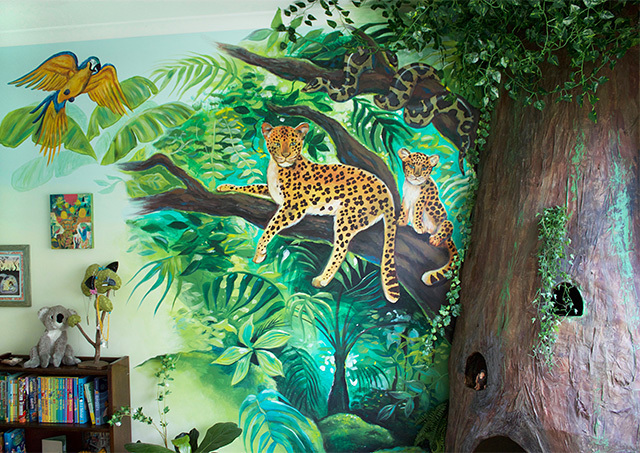 The mural requests were: jungle themed and needs cheetahs and a python in it. 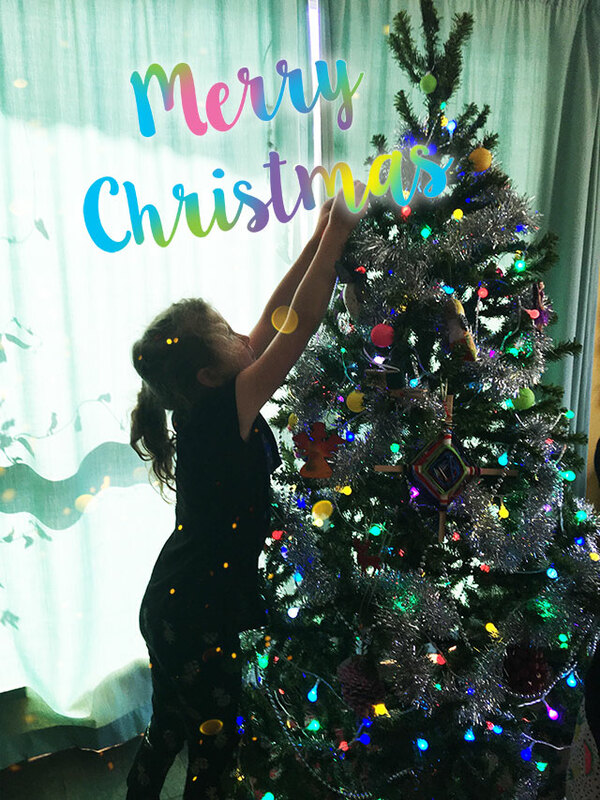 The big paper mache tree was made a while ago in my girls' previous bedroom, but as they're growing older I felt they needed their own space and so a new bedroom was made free, and the tree found it's new location in this room. I have received many questions about the construction of the tree in the past so I will elaborate on the how-tos in a future blog post. 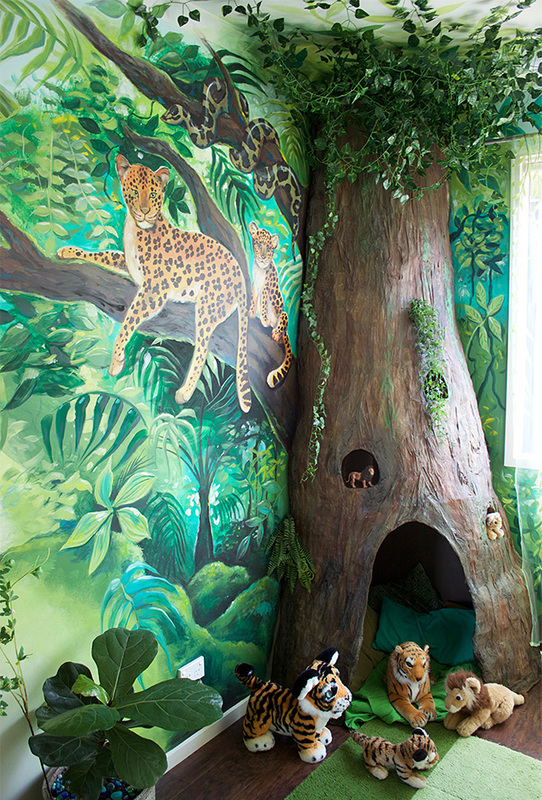 I'd always dreamed of doing up my own kids rooms before we even had kids. 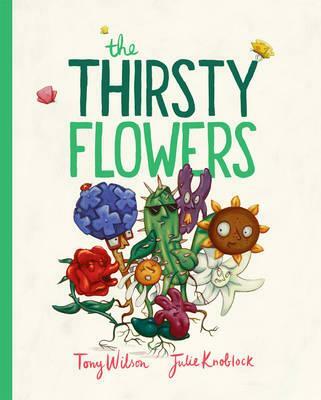 The problem is they're so quickly growing and won't be kids for much longer, so I thought, it's now or never! 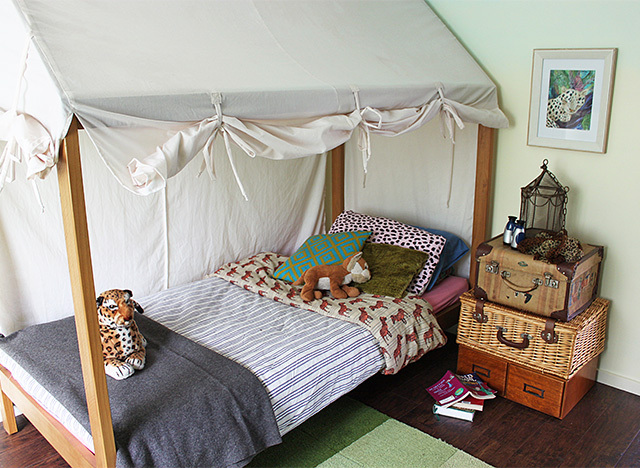 My youngest used to have a pretty white iron bed, which didn't really fit into the new bedroom's theme. Husband wasn't keen to buy a new bed considering she had one already that was working perfectly fine. 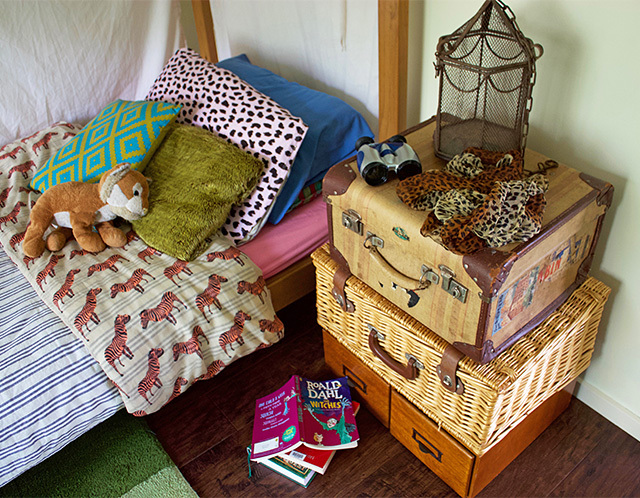 Then by a strange coincidence, a friend showed me a photo of the bed below at school one day saying she was getting rid of it, and would I like it, FOR FREE. 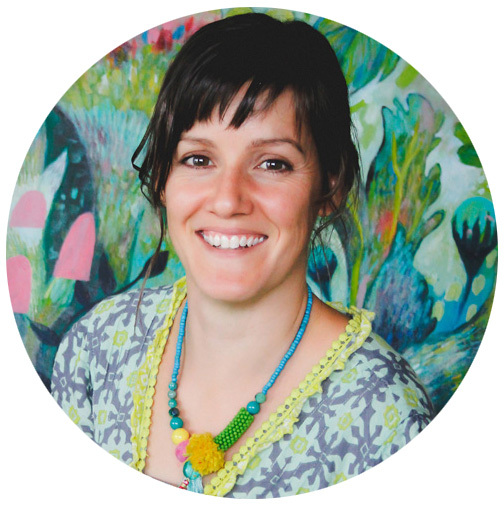 She also threw in the green wool rug AND the 10 metres of white fabric. Friends that declutter are the best! Thanks, Steph! I tea-stained the fabric by soaking it in the washing machine with all of the tea bags from my canister brewed in boiling water and then tipped into the mix. After 24 hours of soaking, I put on a spin cycle. I didn't bother rinsing as I wanted to keep as much of the staining in as I could. 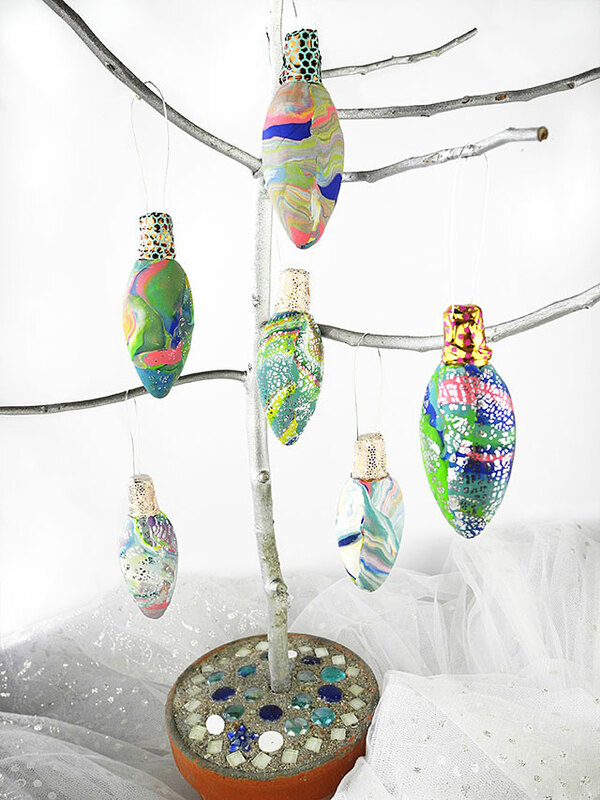 The tree needed some paper mache repairs to it and a bit of fresh paint. It's big enough for a kid to sit and stand in, and the little 'windows' have ledges so that toys can sit in them. 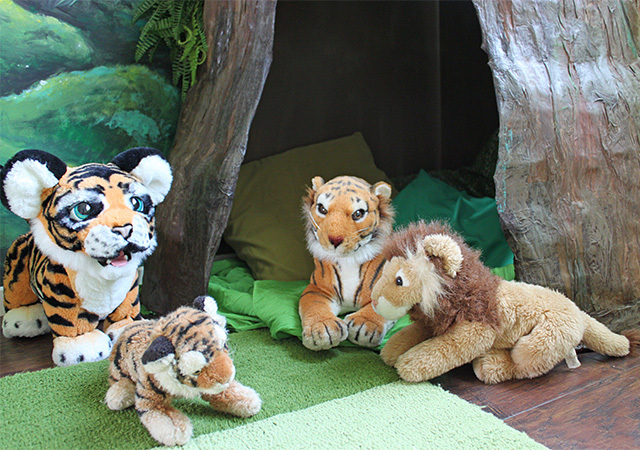 The kids can also peer out of them from the inside, too. 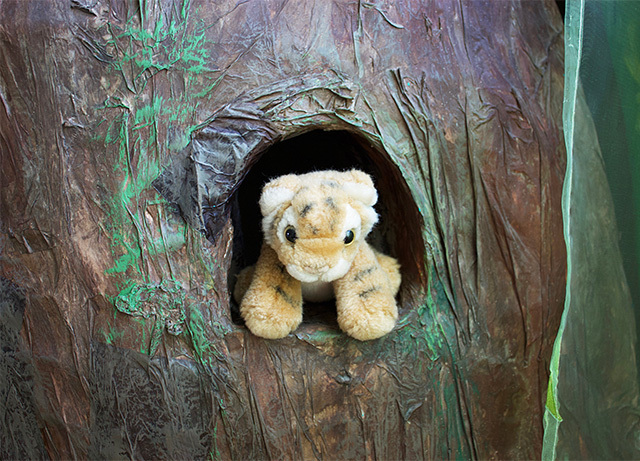 Oh, hello there little tiger! I didn't want to cover the whole wall with the mural, as I wanted some space for furniture underneath. 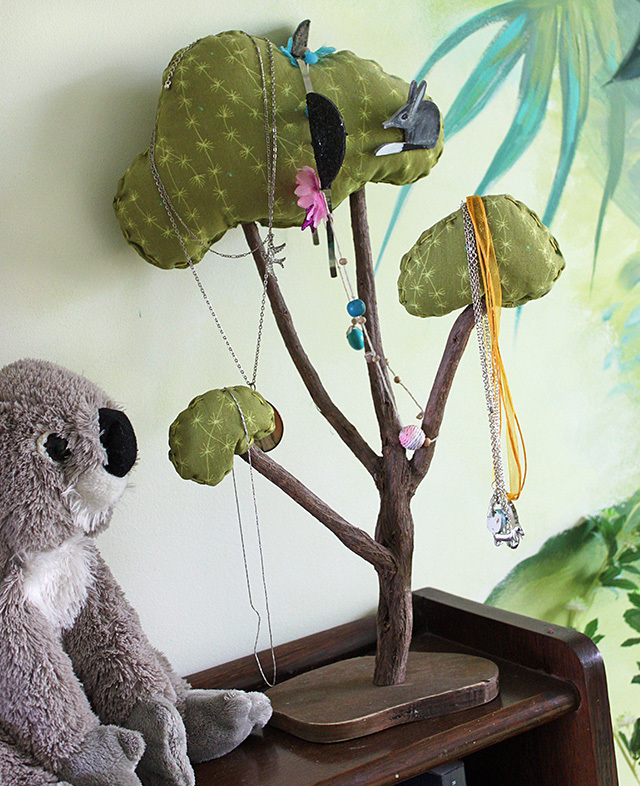 A handmade mini tree ornament we found at the local Arts Market doubles as a jewellery holder. I found both the curtains and the vines on eBay for a steal. Other than buying a tonne of paint to cover the previously dark walls (about 5 freaking coats! ), this project was pretty budget friendly. The curtains were such a happy find. They are just cheap ones but they really compliment the room and fit the theme. Detail of a corner with some personalised touches below. 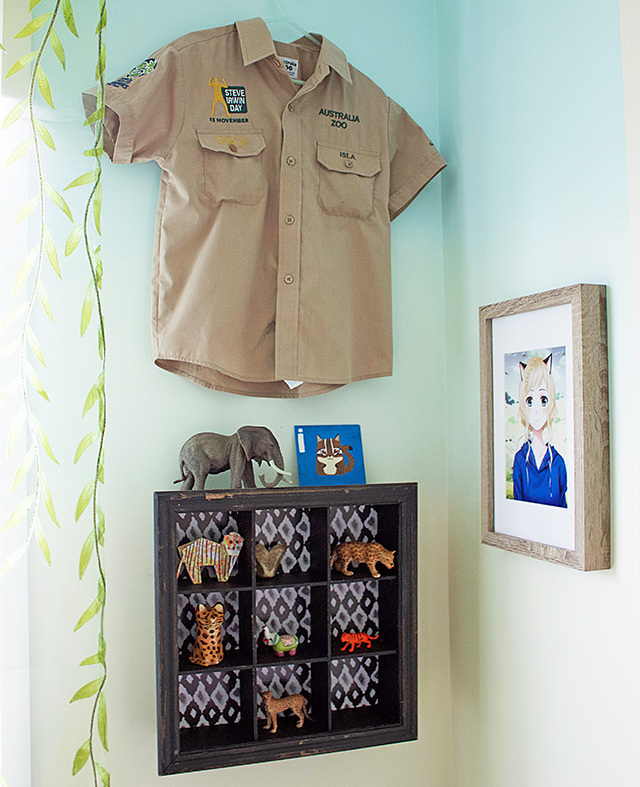 My girl's treasured Steve Irwin shirt from the year she raised money for wildlife as a Wildlife Warrior, a little shadow box for collections (also from Steph), and a customised anime picture from a good friend. I had such fun decorating this room! I have a lot of work ahead of me completing new bedroom #2 for my eldest daughter, my new studio (as we're doing a room swap), and the main bedroom that the husband and I have just moved into. Oh my! Almost makes me want to sit in bed and binge watch Netflix it's so overwhelming! 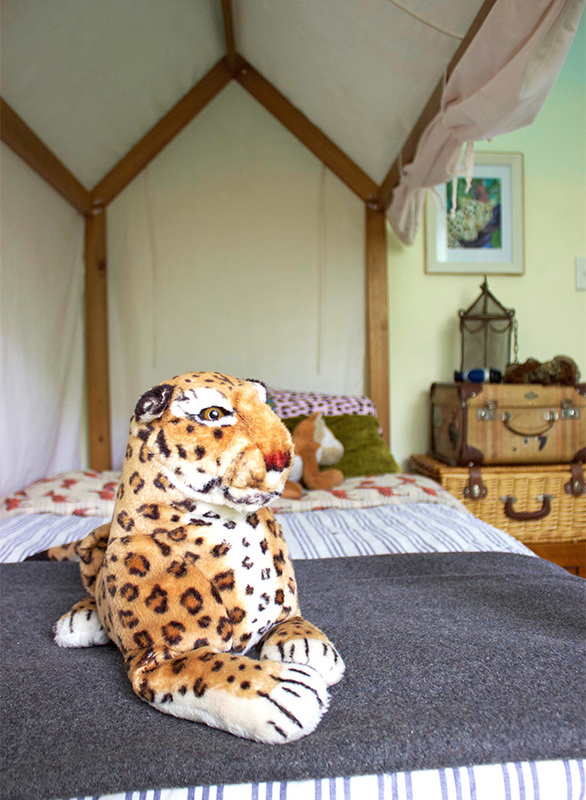 I hope you have enjoyed reading about our new African-jungle-safari themed kids room as much as I enjoyed making it. If you have any questions, please feel free to post them below. Bunny Turns Ten! 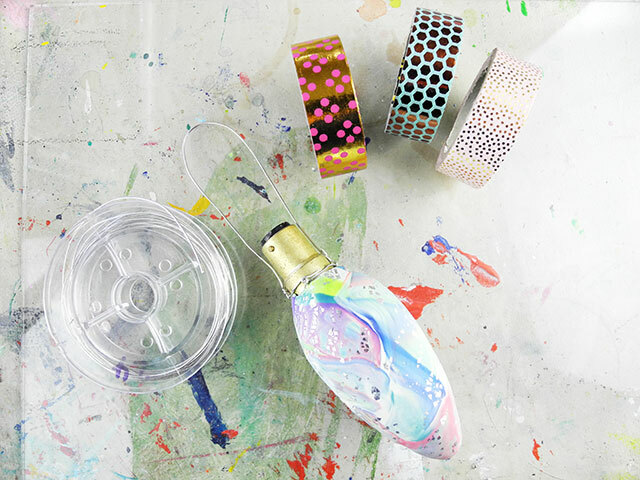 And Bonus DIY Party Favor craft Tutorial! Bunny turned 10! I can't believe it! So we had a special celebration, and I wanted to share a tutorial for the party favor craft we did at the party. 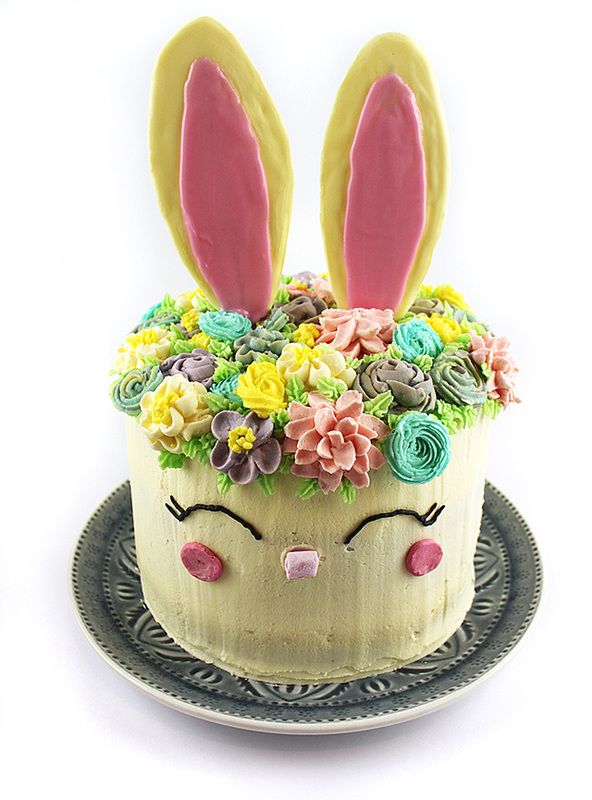 First up, here's the bunny cake that I spent a whole day on making! 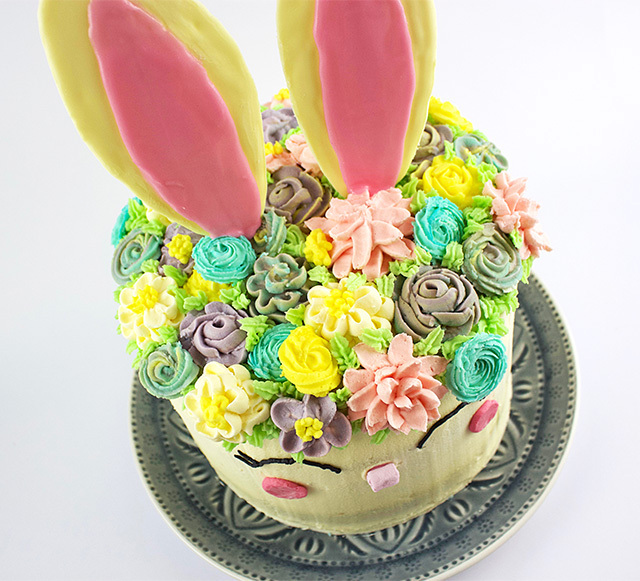 I found a beautiful cake on Pinterest and set out to recreate something similar. I've never piped icing flowers before, but I had a piping set, the will, and then a bit of searching how to pipe flowers on you-tube and I was ready to go. 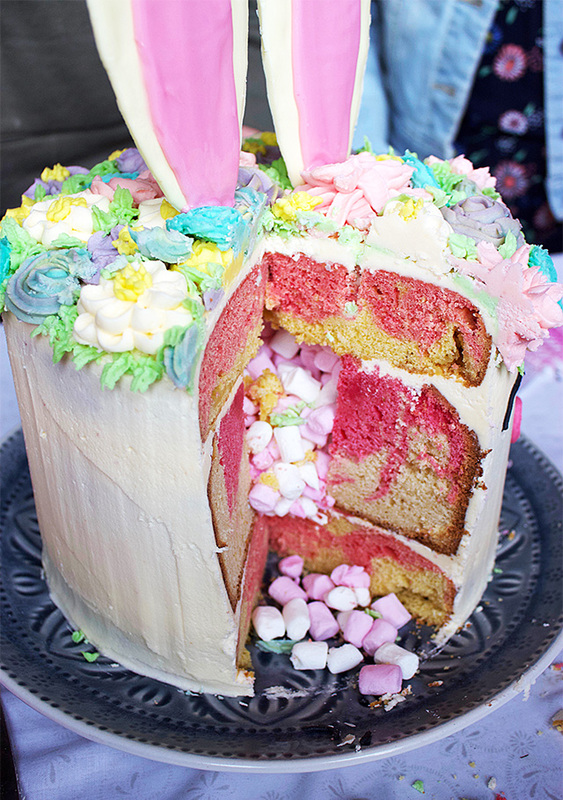 The cake was marbled pink inside, and I also cut out a chunk out from the center and filled it with baby marshmallows. 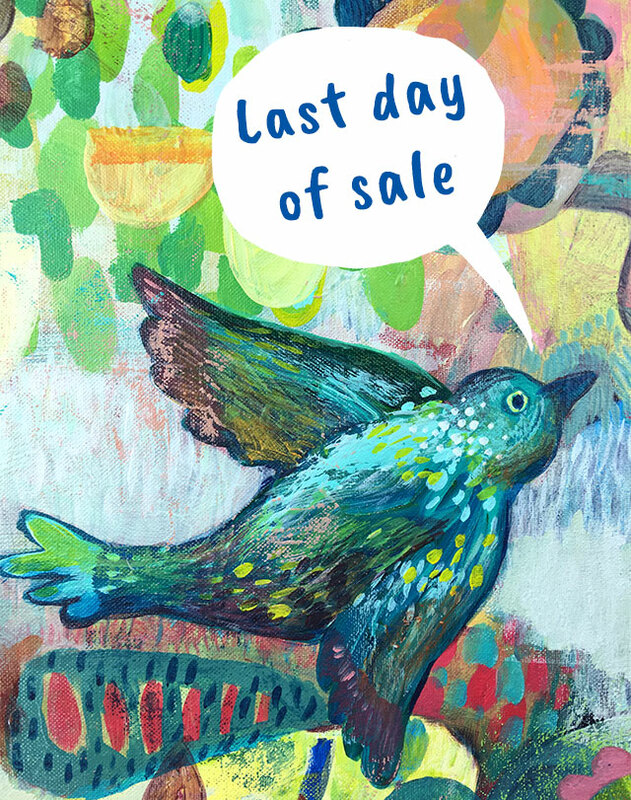 Grab 'em while you can!! 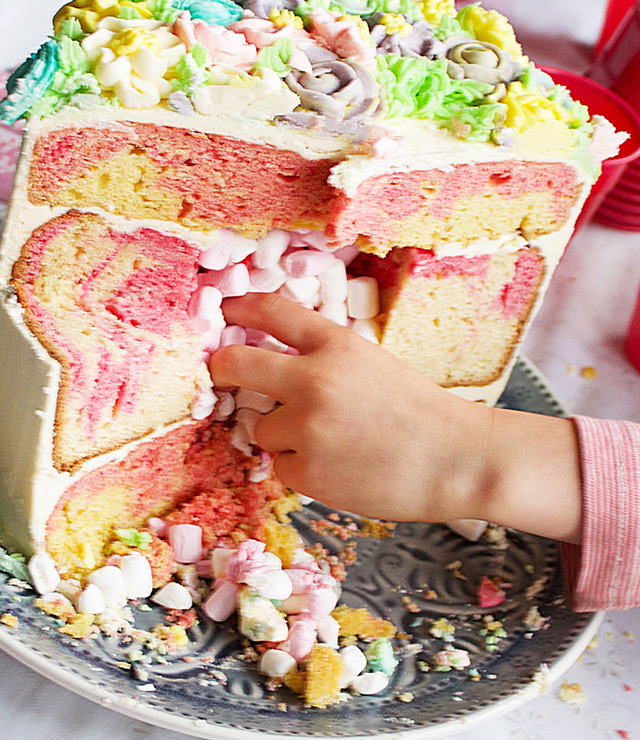 The cake below was my inspiration, but the link on Pinterest didn't go anywhere. 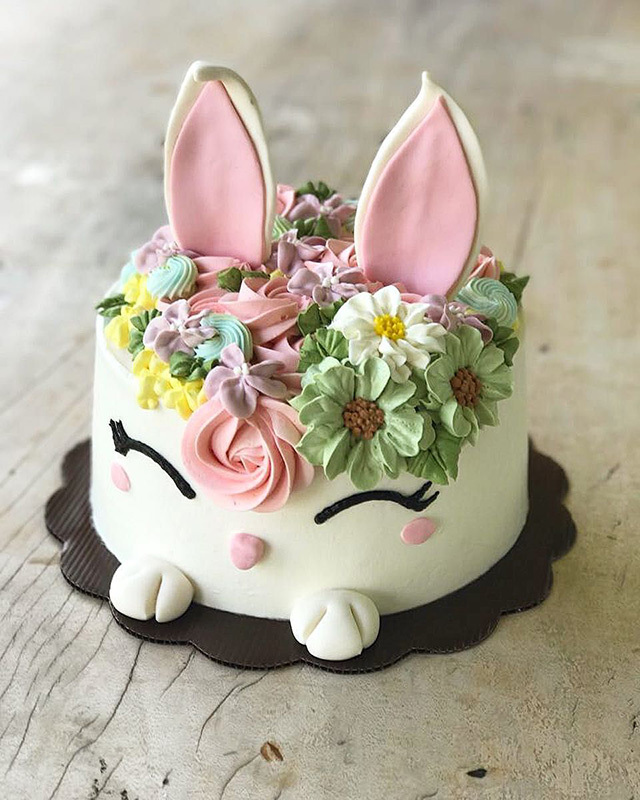 If this is your cake, or you know who's it is, please let me know so I can credit it. 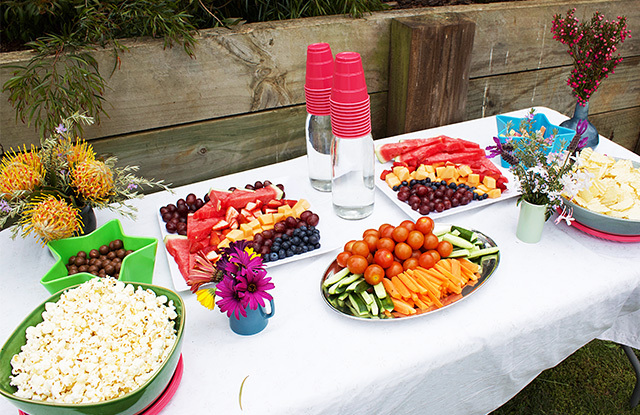 In lieu of lolly bags (whose kids need extra sugar after a party!?) we completed a craft activity which I finished up whilst the kids were busy so they could take them home with them when they left. 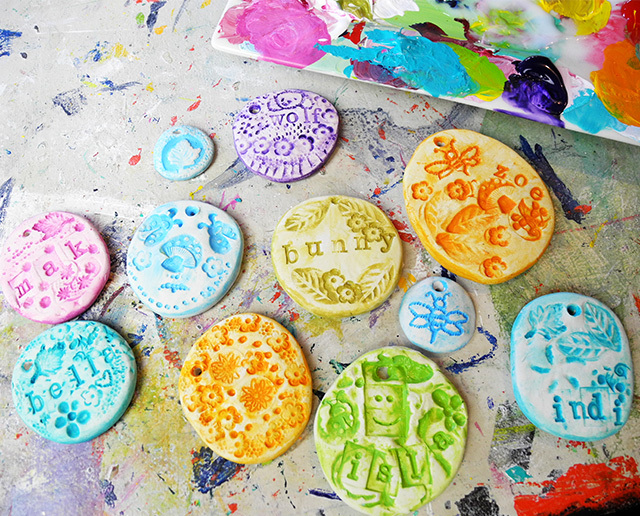 We used stamps, beads & patterned buttons to stamp into flattened disks of polymer clay. I found I had to roll the clay out for the girls to keep a nice even shape. We poked holes through the top with something sharp. A skewer would work well. 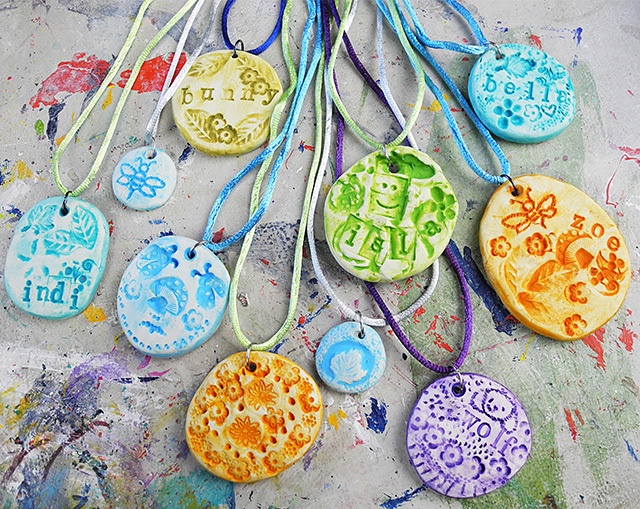 After the girls finished stamping their pendants, I baked the clay in the oven. 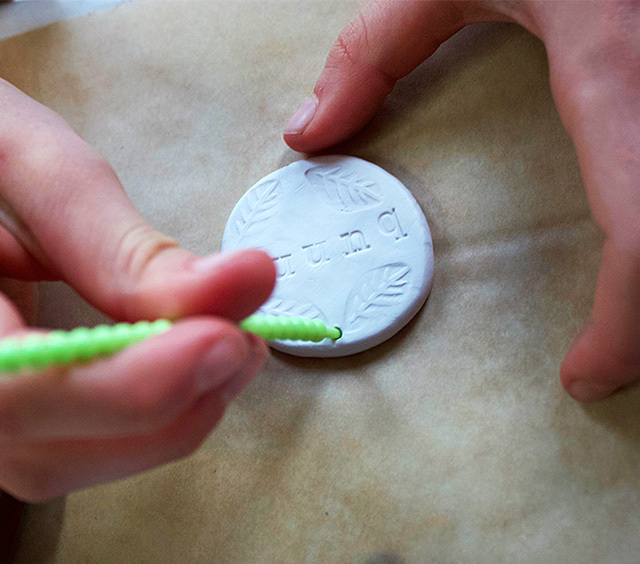 We used white Sculpey; it's easy and quick to get soft and usable. After they baked and cooled I took orders for colours, and painted them all over. I then took a damp tissue and wiped away the excess colour, leaving the paint to sit in the recessed areas to make the texture stand out. I added jump-rings to each pendant and a bit of coloured cord. They were a hit and I don't think the lolly bags were even missed! I could've done the painting with the kids too, but we just ran out of time. 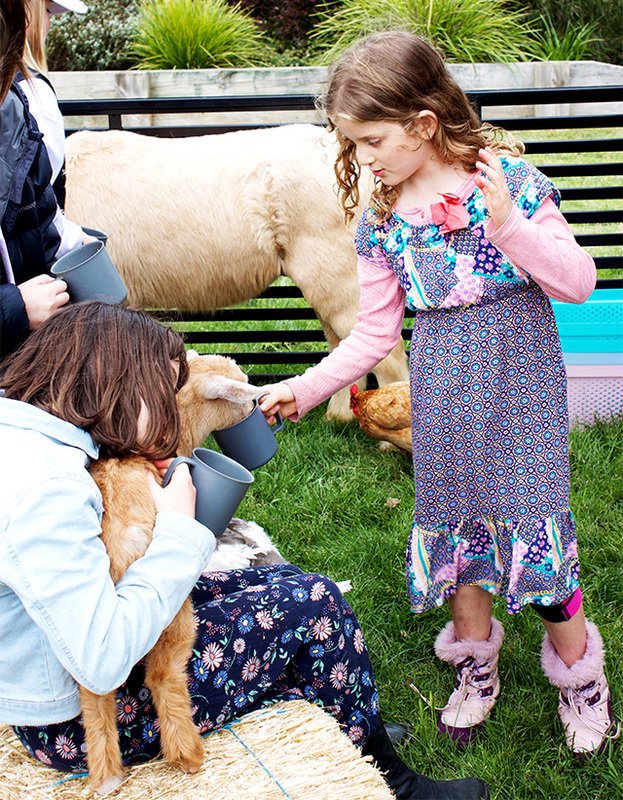 We had some farm animals (including bunnies of course) at the party for a couple of hours so that was our main activity. Now to rest and recover, and get back to normal life!